After a perfect honeymoon on Hawaii we went to San Diego on the 3rd of Oct with US Airways airlines (which is crap, no good service on a 6 hours flight, you even have to buy food). 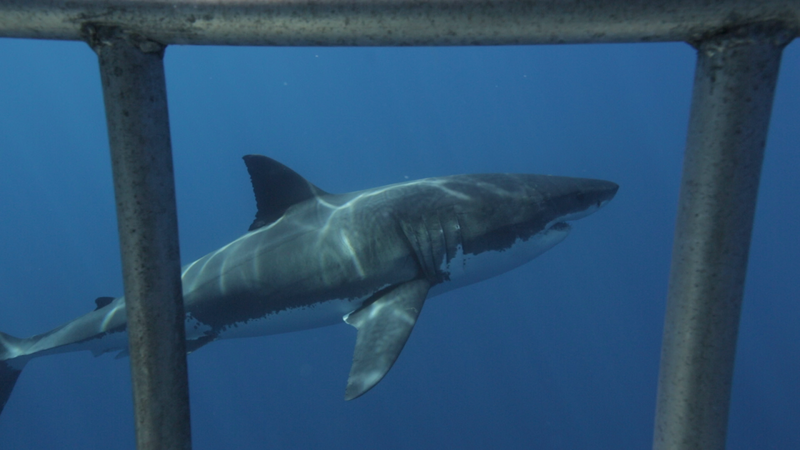 In San Diego we met our danish group of 8 who we were joining for a white shark expedition on Isla de Guadalupe, Mexico. Then, a group of 10 underwater photographers/videographers went over the border around Tijuana and arrived in the harbour town of Ensenada, Mexico 2 hours later. This was our first experience of Mexico and it was a special moment driving from one of the richest countries in the world to one of the poorest one. We boarded our live-aboard scuba diving boat and headed for the 18 hour long trip to Isla de Guadalupe, the best place in the world to encounter the great white. The reason or this is the incredible good visibility you get in the water compared to South-Africa or south of Australia. We slept almost all the way after taking sea sickness pills. When we arrived, the island reminded us very much of the Farallon islands outside San Francisco which we visited last year for a great white shark expedition. Rocky brown mountains with lots of seals on the beaches and surroundings. The ocean was calm like a mirror and the idea of a great white patrolling the deep under us was very exciting. In this national park they "chum" to get the shark close to the cage. "Chum" is a mix of mashed fish meat which stinks, but the sharks love the smell. Also, when the shark is visible they throw out tuna chunks on a rope to get the sharks a little bit excited and wanting to stay longer. Evidently they´ve done research which concluded that chumming does not affect their eating pattern. From day 1 we had action in the cage. Actually all days except the last day we had shark encounters. This was a dream come true, several times. What a magnificent creature, not at all the man-eater we learn from the movies. When underwater its very calm, big and beautiful. Its been on this planet longer than many other animals, adapting. Its favourite food is seals, lots of blubber. Sometimes the tuna chunks came so close to the cage so the shark had to bite the cage to get the tuna and we found teeths from the sharks mouth on top of the cage, amazing. We will never forget the moments we had on Guadalupe, it was actually mesmerizing. Also, the liveaboard was excellent. We had our own cabin, mexican food all the time, movies on the TV to kill waiting time and we made some good friends with the danish divers, what an EPIC trip. Thanks to Mads, the group leader, and all the other guys for making this trip a memory for life. More pictures will come but we need to go through them in march 2014 as we take pictures in RAW format and we want to retouch the "poor" ones to make them look good for you guys. After arriving in San Diego again on the 9th of Oct we had a "debriefing" with the danes downtown. It was finished at 5am when we wrapped it up in the jacuzzi at the hotel and headed for our plane to Cancun which left 6.30am. In Cancun we met up with my cousin Henrik and Hanne who we dived the Isla de Mujeres with. The dive site is called "the museum" because of the many underwater statues. This was some sort of a research dive for the artificial reef we`re building in the fjord of Oslo (see Svestad Undervannspark - only in Norwegian). I will make an own blogpost about this on the ProDykk blog. Also we had a second dive in the 29C water at the house reef which was a beautiful aquarium, huge barracuda encounter, spider crab and colorful moray eels. Too bad we were late for the 100-200 whaleshark that was there 1 month ago.. The next we went from a lousy hostel in Cancun to our friend Emilie (Mél worked with her on Koh Tao) in Playa del Carmen, only 1,5 hour away from Cancun with bus. The bus are comfortable and cheap with DVD`s, much like in Asia. Playa del Carmen is a very nice place to stay to experience a nice beach, tourists, good mexican food, shopping, daily life, Isla de Conzumel, mayan pyramids (daytrips) and diving. We got in contact with a friend-of-a-friend in Tulum who works with tech, cave and sidemount diving in his company Blue Life. Frank gave us all skills and knowledge we needed to dive sidemount and we had 6 amazing dives in the cenotes and caverns of Jardin de Eden, Dreamgate, The Pit and the Pet Cemetary. To dive in a cenote is a very unique experience we will never forget. It should be on every divers bucketlist. Each cenote is different and cavern can be very decorative. The most memorable cenote was the Pit where a layer of hydrogen sulfide is floating on the bottom from 28 to 35m, making it a cloud of mist. Since the cenotes does´nt have current the water and mist stays "static" and if you have good buoyancy and a little bit of imagination it feels like you´re floating in the air. A cenote is not always easy to get to. We had to drive several kilometers into the jungle, then lower or climb down with the tanks to the sinkhole, mount your gear aerodynamically to your body and climb/jump down in the water. When diving we have to be extremely careful with buoyancy because of all the silt in the cavern. Silt is a thin layer of mud which can stir up very easily once disturbed. Since we´re diving with the purpose of filming or photography the visibility means everything to us. A highly decorated cavern with the opening of the cenote in the background. A mist of hydrogen sulfide, its harmless to divers, but does have a distinct rotting-egg smell that divers can detect even underwater. The sun hits the cenote at the right time of the day and photography is suddenly very fun. The next days we´re planning to spend in Playa del Carmen to relax, do laundry, visit the mayan Chichén Itzá, go to the beach, do 2 hour yoga in the morning (just finished that now actually, exhausting but good for the body) and prepare for our next departure which will be sunday. We don´t know where to go or what to do before we´re going to Florida on the 2nd of November but we might take the bus from here to Belize City.. Any suggestions anyone?